Sadly, a turkey neck does not only occur with aging or with weight gain- for some, genetics play a big part in having a double chin. Regardless of the why, there are now many options of how to fix this aesthetic problem. From completely non-surgical to minimally invasive to mini-surgery, the days of the turkey waddle are numbered. We're talking about the loose skin or jowling of the jawline that erases the definition between the face and the neck and here are 3 ways to restore contouring to that pivotal area. Recently featured on The Dr. Oz Show, Ultherapy uses ultrasonic energy to stimulate collagen growth. Collagen, which is responsible for maintaining the firmness and shape of skin breaks down over time, causing sagging and wrinkles. Ulthera uses DeepSEE technology which allows physicians to treat to the proper depth for the best results possible. Treatment takes less than an hour and most patients see results immediately with continued improvement as more collagen grows. "With Ulthera, we can go deeper under the skin," says Houston Ulthera provider Dr. Haresh Yalamanchili. "We can reach some of the deeper facial structures and some of the connective tissue that we could only get with surgery before. That is truly what's exciting about Ultherapy." As a board certified plastic surgeon, Dr Yalamanchili believes that Ulthera offers a non-surgical alternative to the traditional neck lift. "We can tighten up some of the deeper muscles and connective tissue without having to use a knife or sutures. Therefore you don't have the downtime or the expense associated with traditional surgery." Considered the gold standard of laser lipolysis, the newest model of the Smartlipo boasts 3 wavelengths to attack fat, melting adipose tissue before aspirating it through the same incision. For some, the turkey neck is an accumulation of fat which needs to be removed to define the neck. Ideal for delicate areas such as the neck, Smartlipo offers physicians and patients alike benefits that include local anesthesia and less downtime. The procedure takes approximately one and a half hours and it may be performed as an out-patient procedure. During the procedure, the patient can remain awake, as only local anesthesia is needed for numbing. 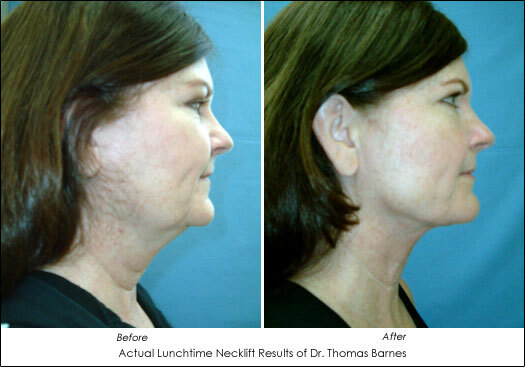 "Using SmartLipo laser liposuction, I can remove a little fat and actually help heat the tissue so it shrinks down," says Newport Beach Smartlipo Neck Lift provider Dr. Thomas Barnes. He says that patients heal quickly and most are able to return to work the next day. "In just a few days, patients can be back on the beach or skiing or doing whatever looking 10 years younger." "I have a lot of people in their 30s, 40s and 50s who don't need a facelift but have a little excess fat and maybe even some excess skin in the neck area," says Denver Smartlipo plastic surgeon Dr. W. Jason Martin, "We can Smartlipo the jowls and the neck to clean up the whole jaw line, tighten up the neck area and have a fairly transformative effect on the patient with an hour and half procedure in the clinic and with not much downtime." For patients who are older and may need a little more work to tighten up the neck area, a procedure such as the Whisper Lift could be just the ticket. A version of the Mini Facelift, these procedures are surgical in nature and tighten not only skin but underlying muscle as well. Small incisions through which the procedure is performed are placed where they will be easily hidden once healed. Typically performed under local anesthesia, this procedure may take an hour and a half to two hours to complete. Individual results vary. No promise or guarantee implied. 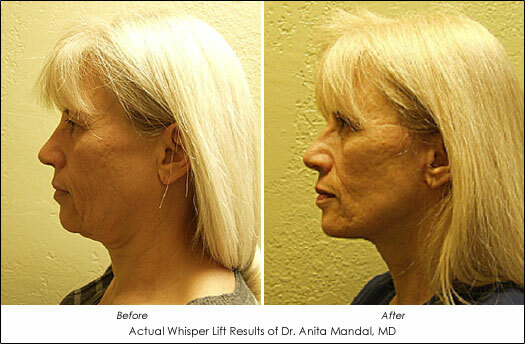 Developed by Palm Beach plastic surgeon Dr. Anita Mandal, the Whisper Lift is ideal for patients who aren't ready for a full or traditional facelift. "Over the years, I've had a number of male and female patients come in for consultations during which they expressed concerns about aging in the cheek, jowls and neckline," states Dr. Mandal, "And while the majority of them recognized they needed some sort of surgical procedure to improve those areas, many were quite apprehensive about undergoing a full facelift especially when combined with the increased risks and side effects of aggressive anesthesia." Whether you're searching for a non-invasive option or ready for surgery to address your turkey neck, there is an option for you! Be sure to discuss your desires with your physician since each option may have advantages, less invasive typically means less dramatic end results.